If you have ever taken a personality test, then chances are you have used a Likert scale. Generally speaking, Likert scales measure varying degrees of attitudes or opinions. They normally consist of either a question or statement with five to seven possible responses, though they can have as many as nine responses and as little as three. The responses reflect different levels of agreement. Have a look at the following example of a typical Likert scale survey question. Here you can see a simple example of measuring agreement with a particular statement. The great thing about Likert scales is their versatility! 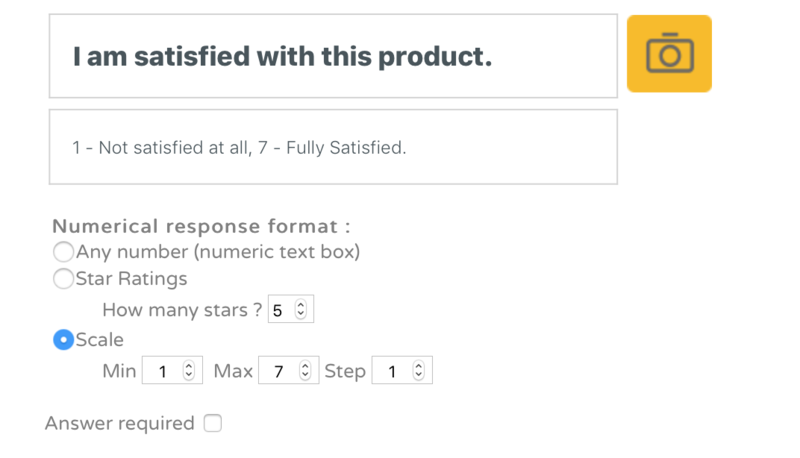 How and when to use Likert scales? Likert scales expand beyond the realm of a simple “yes” or “no” questions, but don’t quite give you an opinion as deep as open questions. Therefore, they make a perfect middle ground for getting opinions with a click of a button, but without sacrificing the participant’s time by writing an open-ended answer. The less time and effort for the participant, the better, and this means more responses for your surveys! Let’s take a look at a few examples when you might want to use a Likert scale. The great thing about Likert scales is how versatile they are, and they can be modified and adapted for a huge range of different surveys. Use them anytime you would like specific or more detailed responses, just make sure you are using them correctly! Let me share a few tips with you on how to use Likert scales. Try to limit questions to a single trait. The following is a bad example of a Likert Scale question because it uses two separate, unrelated terms, functional and affordable. It is best to evaluate these traits in separate questions for better results. 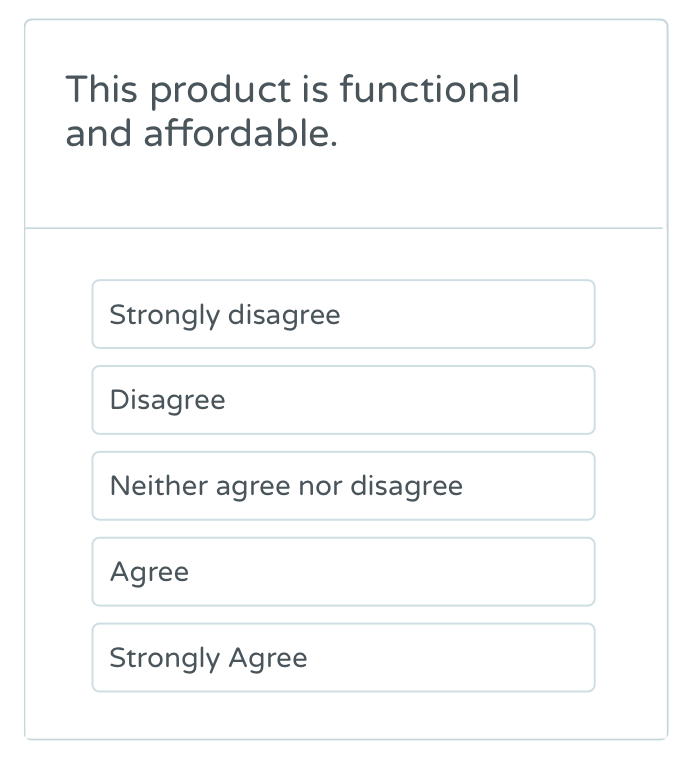 A participant might think the item is functional but not think it is affordable, so this is not an acceptable Likert scale question. Group questions about similar topics together. For example, do not include a question about service in a group of questions relating to the quality of your product. 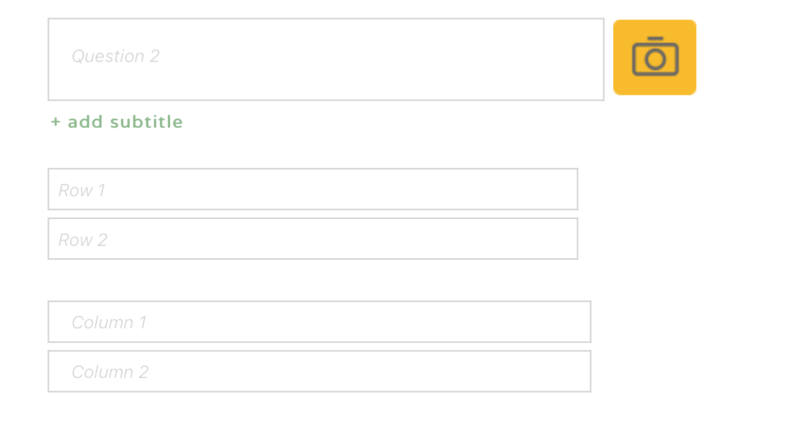 This prevents jumping around of topics and makes the survey smoother for the participant. It also makes it easier to see trends and analyze your data because similar questions will already be grouped together. Be consistent with the scales in your survey. As we saw above, Likert Scales can measure a variety of different things. However, trying to measure everything in one survey will increase confusion, and some participants might not even notice the scale changed! It is therefore best to use just one or maybe two scales for a survey. Extra tip! If using two different scales in the same survey try to separate them so they aren't next to each other. Try to stick to an odd-number of options. Although you can use an even-number of options, this forces neutral participants to lean to one side (either positive or negative). Not having a suitable, neutral answer for a participant creates stress and makes survey results less accurate. Make surveys anonymous for the most accurate results. This might not be suitable all the time, but having anonymity reduces social-conformity pressures. If, for example, you are making an employee satisfaction survey, then your employees will be more inclined to answer how they think if they do not have to worry about being singled out! 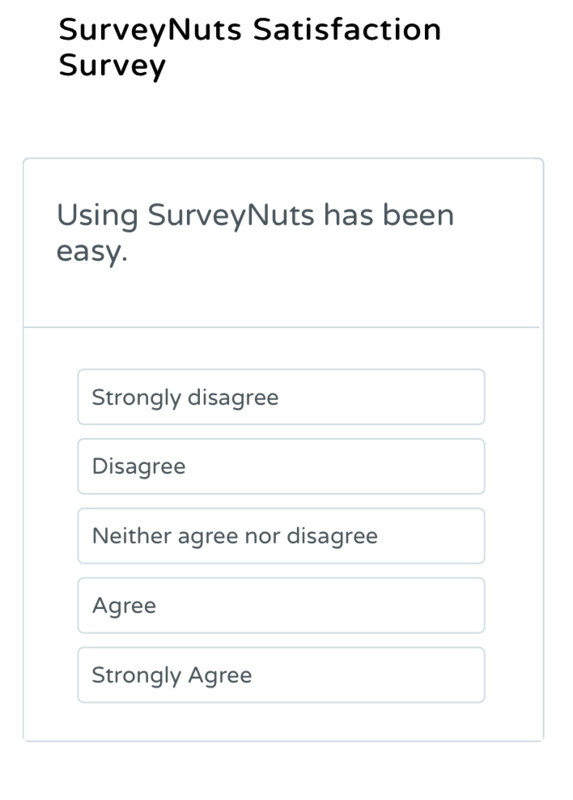 SurveyNuts offers a variety of different question types, and as such there is more than one way to create Likert scales. But don't worry, it's simple and you will be a pro at using them in no time! 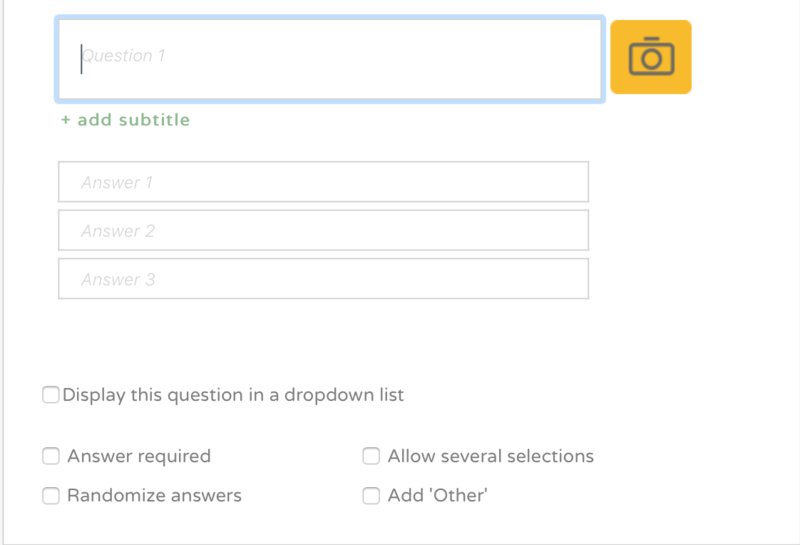 As you can see from the above option, you will want to first add a title for your question. This can be either a statement or a question. Then, you will want to add the responses. In this case, let's do five. More options to add answers will appear automatically as you type, or you can manually add more answers by pressing the "tab" key. This is how a Likert scale question might look with the "poll" option. Since you want one clear, specific answer, it is best to leave "allow several selections" unchecked. "Randomize answers" should also be left unchecked because you want the answers to be a scale, and they should go from either increasing to decreasing or decreasing to increasing. This might look a bit more complicated, but rest assured it is easier than you think! Simply add a question or statement in the main box to begin. 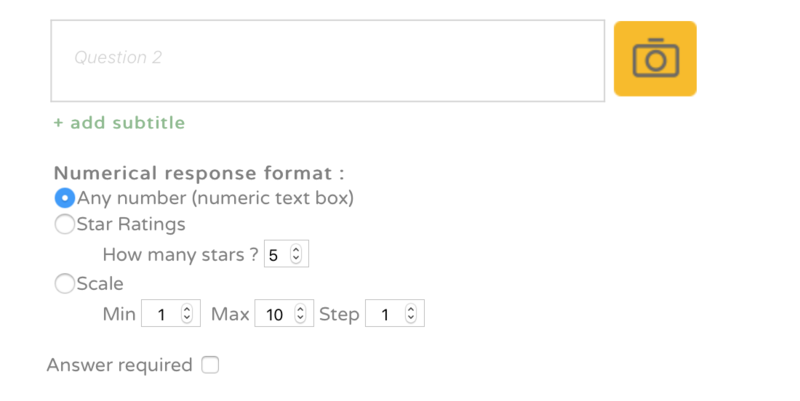 Then, you can either select "Star Ratings" or "Scale." Let's use a scale from 1 to 7 for this example. When using numbers for a Likert scale, you will need to clarify which numbers are the negative extremes and which are the positive. This is extremely important! Otherwise, your participants will not know which side to choose. You can accomplish this easily using a subtitle. Let's say that 1 is extremely displeased and 7 is fully satisfied. This is how it should look when done. You can even assign values for every number if you so wish, just add the values in the "subtitle" area. This is perhaps the best way to create a Likert scale, or at least Likert scale questions that are similar! For this, we will put the questions we would like to ask in each row. Let's try two simple questions. The columns are the varying scales and answers. Let's do 5 columns, with a scale from "very unsatisfied" to "very satisfied." You might be asking yourself what we should put for the title. That is completely up to you! For this example, we will just say something simple like, "Please rate the following questions truthfully." This opens up many possibilities for you to create Likert scales. The matrix is also good because it keeps the scale consistent for each answer! 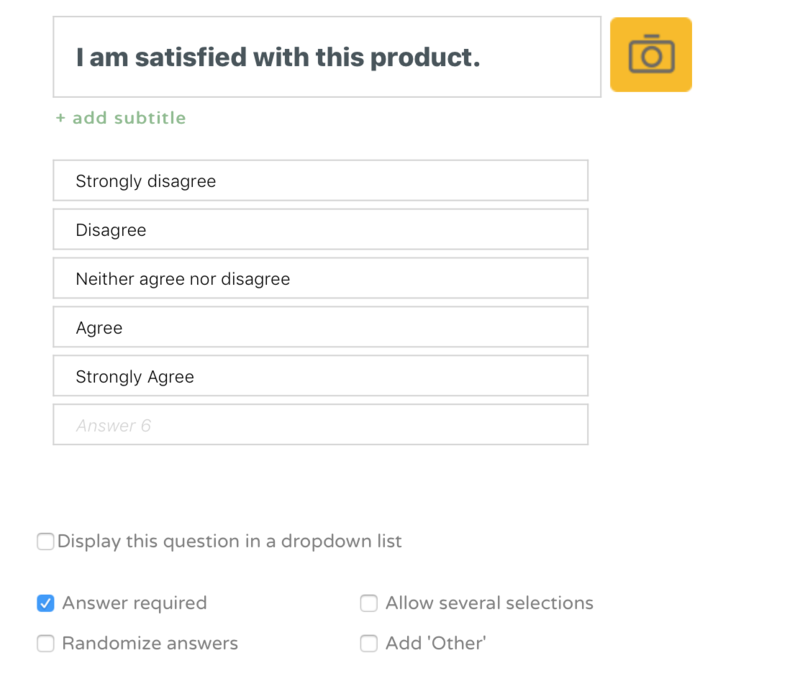 Now that you have a good idea of what Likert scales are and how to use them, try implementing them in your next survey! They will help you get deeper, more accurate opinions and make analyzing responses simple and effective.